The medical technology sector is attractive due to its stable revenues, high margins and strong economic moat businesses. Medical technology is set to see a prolonged period of growth, courtesy of favourable demographic trends worldwide. My MedTech series plans to compare some of the more attractive businesses in this sector. 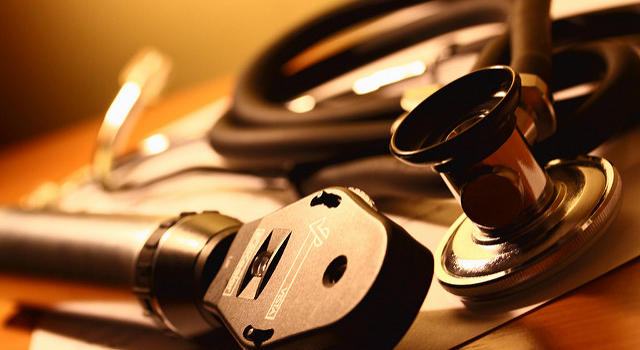 Medical technology is an attractive sector. A vast array of tempting businesses operates in this industry. More focused players like Abbott Laboratories (NYSE:ABT), Medtronic (NYSE:MDT), and St. Jude Medical (NYSE:STJ) vie for this space alongside more diverse businesses like Johnson & Johnson (NYSE:JNJ), 3M (NYSE:MMM) and General Electric (NYSE:GE). I plan to open up a series comparing the different businesses operating in this industry against each other (at the end is a list of those I am currently planning to cover). Doing so will allow me to ascertain the stronger and weaker performers as well as those more or less attractively priced in this appealing space. Elsewhere, I have begun a similar series related to the equally appealing food sector. With this new series, I intend to do much the same, focusing on dividend-paying members of this peer group. First, however, I thought it best to offer up a little background on the sector. Here I plan to do that and, in the process, give a little insight into why this sector is an attractive long-term investment. In so doing, I will also try to highlight some of the more specific trends in the medical tech sector which are set to take off. Few of us do not recognize that the population of the world is, generally, aging, and that this trend is not set to slow but accelerate in the future. But this is not an exclusively developed region trend. Far from it. The aging population growth is going to be much faster in the future than it has been in the past. 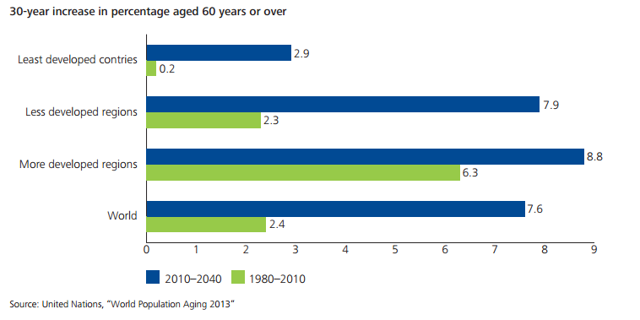 But note that although the more developed regions are set to see growth of the over-60 population accelerating at the fastest pace, all regions are on course to see dramatic growth in the 60+ population. With this comes new challenges with regards to health. Age-related health problems are often vastly different to those from the younger population. From an increase in cardiological, ophthalmic, diabetic treatments and more besides. In these spaces, it is medical tech which predominates. As a result, the growing wealth of nations (from a GDP per capita perspective) will not only see longevity rise, but also the demands upon the state and individuals to pay (in one way or another) for their care and technology. These countries have reached the stage where (as the graph to the left points out) there is a very rapid growth in healthcare spending as a proportion of GDP. Medical Tech the Only Way to Go? Of course, medical tech is not the only way to go. Similar growth trends are set to be experienced across the healthcare sector from pharmaceuticals to care homes. For instance, pharmaceutical prescriptions are expected to see growth much in line (if not faster) than that expected to be seen in the medical tech sector. Rather like the pharma sector, the industry is heavily dominated by the top players. The research costs required to produce the equipment is such that it offers attractively high barriers to entry. Consequently, the biggest 30 players control 60% or more of the industry. Nor, incidentally, is this set to change in the future as we can see. Those businesses that have therefore managed to attain dominant positions in this sector look set to continue to dominate in the future or be consumed by other larger peers (indeed, the medical tech sector). The worldwide medical technology sector is expected to grow at a CAGR of 3.5% from now through to 2020. You will note the drops in growth between 2012 and 2015. This was chiefly the result of the strengthening dollar against the Euro and other currencies. But What About Specific Trends? 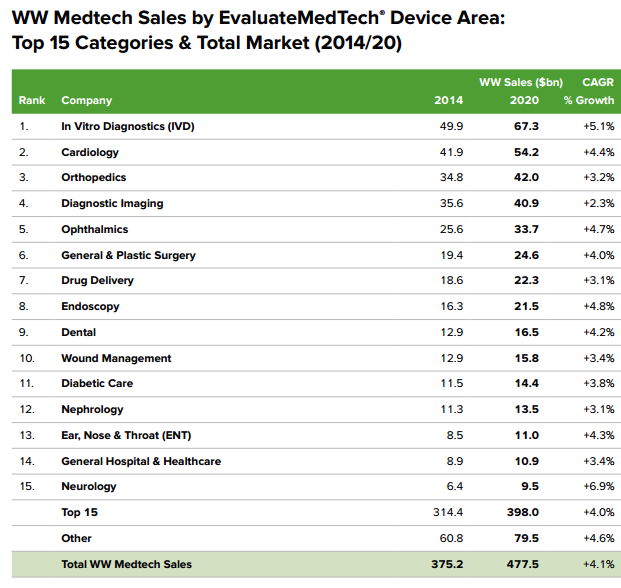 Nor is the secular growth limited to a handful of segments within the medical tech sector. In fact, all look set to see generous growth. Nonetheless, some are on track to see more significant growth than others. Naturally, all major device areas are predicted to see some sort of growth. However, it is both the in vitro diagnostics and cardiology devices which have the most attractive mix of significant present revenues and long-term projected growth. Nonetheless, companies dominating in more niche device areas will also prove attractive when and where they can be uncovered. Well, there is a lot to take from this brief analysis. But, for me, the key takeaways are that the medical tech sector is set for sustained growth in the future across almost all its current device areas. This is an appealing state of affairs for an investor today. You could argue that the attractive mix of significant present revenues and superb-looking growth projections make the in vitro diagnostics and cardiology device areas the most attractive. However, I'd argue all those device areas set for 4% or more CAGR growth will be very attractive if the companies operating in that area are market leaders. But also, we are looking for companies doing well or setting about to do well in those high-growth countries including some more familiar ones such as China, Indonesia, South Africa, Thailand, Brazil, Mexico and Latin America and Asia more generally. This all gives us plenty to ponder on when looking at some of the main companies operating in this tantalizing investment space. So this leaves us ready for the MedTech series. I have arranged the main players into two tiers. Johnson & Johnson. I have already done an analysis of Johnson & Johnson in December. These may feature as part of this series or, due to their diverse nature, just as a more normal analysis of such conglomerates. This I will ascertain in time. Unless otherwise stated, all graphs and tables and the calculations contained within them were created by the author. Creative Commons image reproduced from Flickr user adrianclarkmbbs. Disclosure: I am/we are long JNJ. I wrote this article myself, and it expresses my own opinions. I am not receiving compensation for it (other than from Seeking Alpha). I have no business relationship with any company whose stock is mentioned in this article.